Lord Jagannatha of Puri has many celebrations. There are literally hundreds of festive occasions in the temple every year, but twelve of them are considered to be the most important ones. Of these twelve, the grandest is the Ratha Jatra, Jagannatha’s majestic annual chariot festival. And because the scale is so huge, the work to be done is also of the same magnitude. 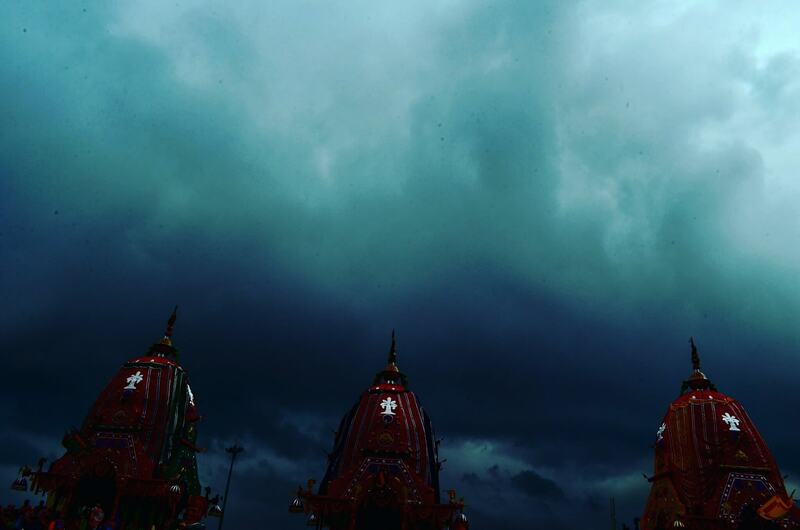 A stunning blue hue encompasses the sky at Puri. Prateek Pattanaik, 2018. Ratha Jatra literally translates to ‘chariot journey’. The other sense of the word ‘Jatra’ comes from the pomp and grandeur in Jagannatha’s rituals. Throughout the year, during all the rituals and festivals of Jagannatha, his miniature Madanamohana image acts as his representative. Ratha Jatra is one of the rare occasions in which the actual deities come out from their sanctum sanctorum. They come out in spectacular processions, mount their chariots and the chariots are pulled across to the other end of the Badadanda, grand road. They stay there for a week and return back. Basically, this is a vacation of the gods. Preparations for the Ratha Jatra start months ahead. Before five months, the process for getting wood is started. Years ago, the wood used to be brought through water channels. Now, things have changed. More than a thousand logs of wood, of different varieties are heaped in the shed constructed in front of the Gajapati king’s palace; this place is the Mahakhala, the workshop where the three chariots would be made from scratch. More than a hundred carpenters work for more than two months, eight hours a day to fashion the immaculate Rathas. Ten leaders supervise all the work. The work starts on Akhyaya Trutiya when the team receives Jagannatha’s garland as permission. Three rathas have to be made for the triad enshrined in the Jagannatha Temple : Jagannatha, his elder brother Balabhadra and his young sister Subhadra. Each of them has their own Ratha or chariot. Jagannatha’s Ratha is called Nandighosa. Balabhadra’s is called Taladhwaja. Subhadra’s is called Debadalana. People in every nook and corner of Odisha are well acquainted with these names. For the three rathas, the craftsmen work in three groups. No ruler or tape is used for making these massive structures. Ancient knowledge and measurement in cubits and fingers has been the mode of transmission of this information for centuries. Carpenters, tailors, ironsmiths, carvers, painters and hundreds of other men work day in and day out to build the massive specimens of Odia art. These chariots still stand as grandly, a testimony to the Odia artist’s dexterity in his craft. On the second day of the bright fortnight of the Hindu month of Ashadha, the Ratha Jatra begins. This happens after fifteen days of dormancy owing to the sickness of the gods. It is as if this period of hibernation leads to a burst of colors, emotions and sounds with the ecstasy of millions. The deities are made to wear the Senapata clothing a day before to protect their bodies from all the pushing and pulling they have to ensure amidst the crowd the next day. In order they come; the elder brother first, then the sister and at the end, as if playing with the crescendo of public emotion, Jagannatha. Also accompanying them are Sudarsana, Madanamohana, Rama and Krusna. The gods are brought to the chariots in a rhythmic swinging motion, called Pahandi. They are adorned with intricate crowns made of flowers and Odia solapith craft. These huge floral headgears sway together with the waves of the crowd. Once they mount their chariots, thousands of people pull the chariots together to the Gunducha Temple on the other side of the road. The return journey is likewise, known as the Bahuda. Before they enter the temple, the deities indulge in a royal display. They are dressed in the magnificent Suna Besa or golden attire. As the king of Odisha, this is a proud moment for everyone around. In the last day, Jagannatha’s siblings enter the temple easily while his angry wife Lakshmi does not open the door for him. Why is she angry, you ask? Well, he took everyone along but not his wife. And so the goddess, enraged has to be placated. Poor Jagannatha utters sweet words to coax her into submission but she only concedes when she is given the Odia Rasagola. This ritual, a 700-year old one, is also the origin of the Rasagola of Odisha. Thus ends this journey of Jagannatha going on since centuries.